In the morning we were picked up by a guide and a driver to go look at some rice terraces and hike to a hot spring. 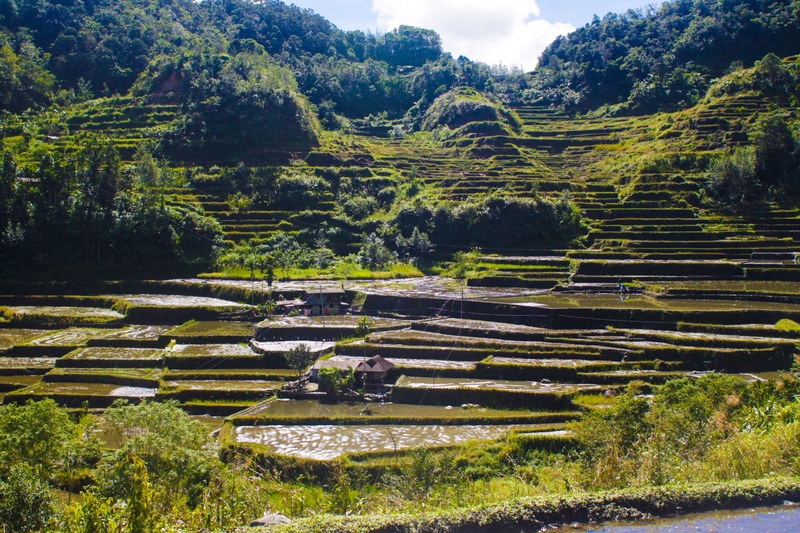 The rice terraces were pretty amazing to behold. The farmers live almost totally off the land selling very little of their produce. They grow loads of other stuff, such garlic, onions, sweet potato, avocado and fruit in and around the rice terraces. They also have tilapia swimming in the actual terraces and all keep chickens which seem to run around everywhere. The hot spring was awesome despite the hot weather. You could control the temperature by moving a rock in a channel of cold water that cools down the geothermally heated water. On the way back we saw 3 menacing looking youths, one sporting a shotgun? Had a slight flash of panic as there’s not much to shoot at except people and chickens and shooting a chicken with a shotgun might defeat the point if you planned on eating it. They just passed us by, with mean looks. The 15 minute journey back to the hotel was petrifying. The roads are notorious there for being perilous when wet and it was bucketing down. Going along narrow roads between a waterfall and a mud slide. It was more like rivers than roads. We had to get out and push once because the bike got stuck. During all of this, our driver hadn’t batted an eyelid. That might have been because he was off his head on betel nuts, the local psychotropic stimulant that comes in the form of a nut that you chew. It makes your mouth red which looks stupid when you smile, which is all the time for the driver because he was high as a kite. This entry was posted in London on 17/11/2014 by marek.